N-XTC Trim Coat N.S. is a thick gel – kind of coating with a high viscosity especially developed to perfect any dark plastic and rubber finish on trims, window frames, grilles, tires and many more auto motives applications on any car’s exterior. N-XTC Trim Coat N.S. is a thick gel – kind of coating with a high viscosity especially developed to perfect any dark plastic and rubber finish on trims, window frames, grilles, tires and many more auto motives applications on any car’s exterior. Besides the darkening effect the quartz origin of this Trim Coat N.S. delivers very good hydrophobic capabilities on beading and sheeting effect. This N-XTC Trim Coat N.S. has gone over 2 years of development and tests and finds its heritage in Germany and Holland where rigorous field & lab tests with many formulations have been done in end to find the best results in protection and appearance for everyday cars, bikes and trucks that drive around the city and country in which these face all effects of a bright day, a dark night, sunshine, UV - radiation, IR – radiation, heavy rain, fog, snow, ice, bug squash, road – wear & grime etc on their rubbers and plastics. The N-XTC Trim Coat N.S. is not developed to be the hardest coating on black textured plastics and rubber parts or not the one with the longest durability. It is developed specifically to protect and resist everyday use and wear that these car parts face every day all together in a well – balanced and safe to use formula that bonds to your black textured plastics and rubbers. 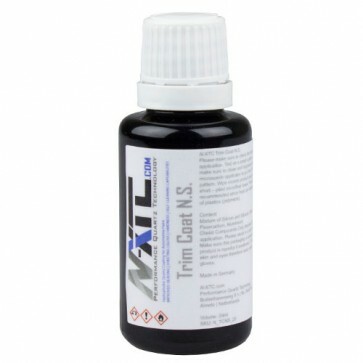 The N-XTC Trim Coat is an easy to use and layer able coating which is safe and does not contain solvents. - Any to apply surface is 100% clean (brushed), degreased, rinsed and dried (microfiber towels and air). - The to apply surface gets cleansed with IPA (Isopropanol alcohol). - The temperature in the application room is between 15 – 25 C.
- The humidity in the application room is below 50%. - The application room is closed and free of dust and particles. N-XTC Trim Coat N.S. gets applied with the N-XTC coating applicator and a black microsuede towel (intended use for rubbers and plastics). Note N-XTC Trim Coat is thick and will run less easily out of the bottle then other N-XTC Quartz products. When N-XTC Trim Coat N.S. is on your applicator + towel then tip this thick gel on the surface evenly. Once tipped on you can spread it thin and evenly. The first results are visible immediately. Curing time is 10 minutes. After curing we advise to buff off excess material with a clean black microfiber towel without any pressure, the towel should take off excess material only. Since N-XTC Trim Coat N.S. is this thick you might feel like removing rests of glue. N-XTC Trim Coat N.S. is layerable. After 2 hours after the previous layer you can add another layer for more depth and darkening effect and a more satin finish on textured plastics and rubbers. After our own tests we can confirm that on a 2011 Mini Clubman the N-XTC Trim Coat holds up for 12 months minimum (dated 30 April 2018). Please read the enclosed application instructions before use. In general this is very well possible like wit all “glass coatings”. The surface can be sanded, prepped, cleaned and resprayed. The N-XTC Trim Coat N.S. is after the 7 days of complete curing like a thin and even coat of satin. This coating is chemically “hard” and is mechanically “anchored” with the surface. The N-XTC Trim Coat N.S. penetrates into the pores of the rubbers and plastics. Therefore with normal care it cannot be removed. Mechanical removability; in the basis is every mechanical attempt like polishing or sanding abrasive. A finishing – polish will not be strong enough to remove the N-XTC Trim Coat N.S, some passes with a woolpad and a strong – cutting compound will take of some of the coating, if it will take off all of the coating will depend on how many layers were build up and for how long these have hardened. It can well be that several passes will be needed. silicones which can cause issues with adhesion.